Gray block apartments in downtown Yangon. The interiors are usually better maintained than the exterior. In November, 2013, I set out to find a suitable apartment in Yangon. The below entry details some of the experiences I had locating housing in this hyper-inflated market, where serviced condos and office spaces are leased for higher rates than in Singapore. The typical apartment in downtown Yangon is small, neglected of charm and pulsating with the energy of immediate community. Windows openly face neighbors just across the narrow lanes below, unabashedly emptying out each other’s lives for display. Adjacent buildings stand so close that cheery mothers can trade dishes from across kitchens with each other. Shouts from domestic ramblings and infighting are not restricted either, nor the echoing noise of the streets below. Rather, throughout the day, you are tuned into a symphony of calls for commerce, camaraderie and religious charity that come drifting up through the heavy sultry air. Perhaps the most soothing of sounds is the early morning chants of acetic women monks collecting alms before first light. After sunrise starts a different precession. Street hawkers selling a variety of snacks and cakes stacked up in large steel plates upon their head sing out the name of their goods in repetitive melodies, perfectly balanced with a kind of acrobat’s legerdemain. Close and noisy living conditions were not a novel experience to me when I moved into my Yangon apartment in November 2013. Having lived across the Eastern Asia and Pacific region for nine years, I had resided in or visited similar apartment quarters in Southeast Asia, China and South Korea. But in Yangon, I felt more intimately connected to the unadulterated reality of Asia. Yangon’s property market at the time was admittedly a large cause for this deviation in living norms. While in other markets, it wasn’t a masterstroke of luck to come across tastefully decorated apartments for $700 or less a month, as my Manila apartment cost me (fully furnished and decorated), in downtown Yangon no amount of good fortune could get you a steal. There were high-end condos, fit for lawyers and international development organization officers with the budgets, and there were the more layman residences for those on the shoestring budget. Nothing existed in the middle range. The few new apartments that were on the market had experienced a precipitous rise in price since the country re-opened for foreign investment in 2011, and thus foreign expatriate workers. Like the upscale hotels, many upscale apartments in Yangon perfumed with a distinct colonial atmosphere that mainly derived value from security and seclusion. These apartments were, however, in the northern part of the city by the two large lakes: Inle Lake and Kandawkyi Lake. 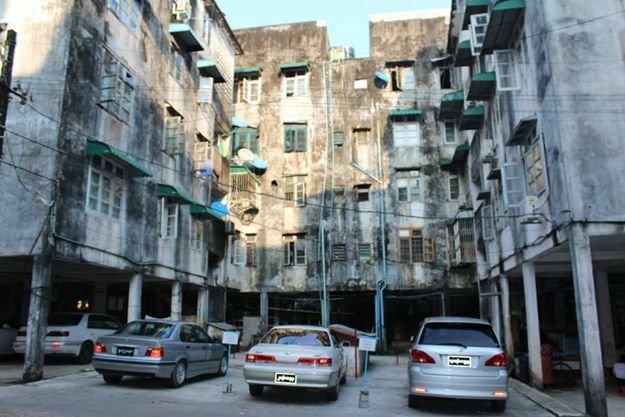 The only other bracket of housing that remained besides this was the common cement block apartment, often accompanied with dimly lit staircases, poor ventilation and the inevitable evidence of betel nut spit – Southeast Asia’s answer to chewing tobacco. The same situation was mirrored in the hotel industry, where the new wave of tourists pushed up prices up further and further. The difference here, however, was that Myanmar did not have more than a small handful of budget hotels to accommodate new arrivals. Part of the open-door policy that is as much a part of the local character as public policy means that domestic travelers usually come to friends or acquaintances homes and stay over as guests, a habit symptomatic of both hard economic times and the deplorable state of budget hostels. My apartment on Yangon’s Merchant Road was abuzz with the sounds of grinding buses on the balmy day when I moved in. The choice of this address was the result of a tireless month-long search, when I set out along with a company assistant to find a space within the budget of $500 to $700. It wasn’t extraordinarily rare to come about a place in this range in the downtown area, but there was always a quirk that made the catch unsatisfactory or altogether unavailable for foreigners. A large two-story loft style apartment – a common style of home in Yangon that conveniently catered to large families – on the market for $500/month would have been a fit, if not for the fact that the multitude of India Jones-style cobwebs that crept across the walls gave the place a tomb-like atmosphere. Both floors were caked in thick layers of dust, furniture and all, and the electricity was shut off, which left me half expecting that there would be a dead mother preserved in the attic. For a brief 48 hours, I thought that I had found an apartment just across the way from my office, located off of Bogyoke Road, named after General Aung San, the country’s famed independence leader, and across from Yangon’s Bahosi Hospital. The real estate agent, a slender Indian woman with bold cheek bones, that was to show me the apartment presented her name card, which proudly featured a hot-red Ferrari and two-story townhouse printed on flimsy paper. Like the market she was working hard to profit in, her card was tackily ornamented to up-sell assets of questionable value. With purpose in her step, she led me an Nillian, my company’s to-go translator and PA, himself fan ethnic Miso Christian from Chin State, down a gray ally lined with grayer block-cut buildings on both sides. The apartment I was shown was grand and well furnished; a TV set, although miniscule, was set up around some wooden chairs and couches, a style of preference among the Burmese, who value good posture. On the second floor, a large Buddhist shrine abruptly greets visitors. It was the size of smallest of the three bedrooms on that floor, a common utilization of space in many Burmese homes. The master bedroom was the most alluring part of the apartment, but it was also off limits, I was told. I could rent this apartment, that was for sure, but only on condition that the master bedroom stay locked up, as well as its connected bathroom, the only working one in the place. For $600 a month, I decided to pass. This turned out to be a fortunate decision, as the landlord wasn’t thrilled about leasing to a foreigner anyways. I spent another week marching up and down concrete steps of apartment blocks in Yangon. Only after a this gauntlet of hideously painted turquoise walls, attic spaces fitting for hobbits and crypt-like storage cellars, did I finally find myself a suitable place to unpack. For change, there was an elevator. What’s more, there was a new faux wooden floor. It was a far cry from the many cement or sodden carpets I found elsewhere. There was even a water tank in the shower room to which I could connect a hot water heater instead of depending on a bucket that had to be filled up daily with icy bathing water. Though as suitable as it appeared, the Merchant Road apartment wasn’t move-in ready. Thick layers of dirt were caked on the kitchen floor and the windows wouldn’t close. Two days of intense scrubbing would be needed to remove most of the dirt, and the side windows were eventually covered in plastic sheets to seal off the studio room from bugs, but some of the betel nut stains never came out, despite muscling plenty of soap against the custard apple-green walls. Across the alley below, I could see in my neighbor’s room, just as plainly as he could see into mine. Even from the distance, there were telltale marks of the betel nut stained on his balcony, perhaps from himself, perhaps from someone above. As far as anyone could be considered, having a comfortable spot to stow away yourself in downtown Yangon means you were on top, with no concern of the middle.